House Minority Leader Darren Jackson, D-Wake, says Gov. Roy Cooper was within his constitutional authority to create a $57.8 million side deal to the Atlantic Coast Pipeline. But he thinks the relevant public records should be released to show precisely how it came about. 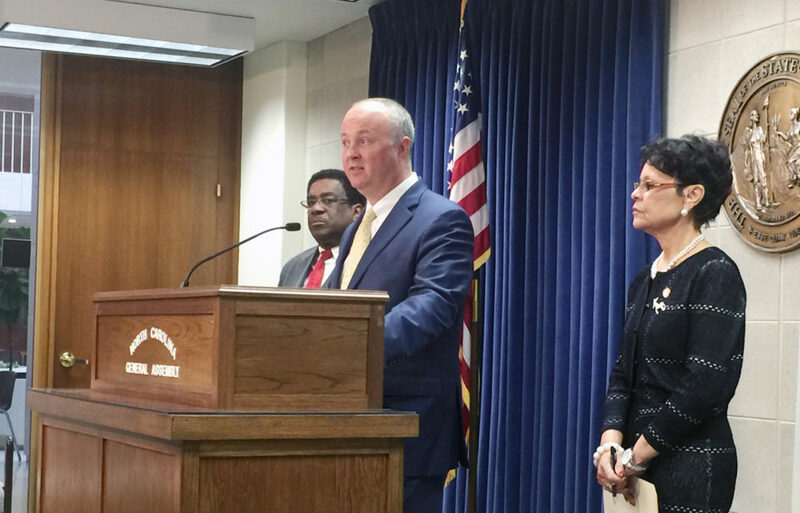 Jackson, flanked by state Reps. Garland Pierce, D-Scotland, and Bobbie Richardson, D-Franklin, at a news conference Thursday, March 15, blamed Republicans for shattering the governor’s plan to create jobs in economically challenged eastern North Carolina. He said he thinks the governor was within his power to create the Mitigation Memorandum of Understanding for taking control of the pipeline money. He echoed Cooper’s justification for creating what Republicans have called an unconstitutional method of receiving state funds rather than directing them through the constitutionally prescribed legislative appropriations process. Energy and property rights, threats to clean air and water, the state’s Native American heritage, and mitigating environmental damage from the pipeline justify creation of the fund, he said. Cooper wanted the money for environmental cleanup, economic development, and renewable energy projects. Instead, the General Assembly passed House Bill 90, rerouting the money to school districts in the eight counties through which the natural gas pipeline would pass. State Department of Environmental Quality officials have testified before the Joint Legislative Commission on Energy Policy pipeline partners are paying $6 million for environmental work needed to return the land and water to their natural state after the pipeline construction was figured into the normal permitting process. Jackson blamed election-year politics for creating the pipeline fund controversy. Meanwhile, many communities in eastern North Carolina are still struggling from the effects of the Great Recession a decade ago and from natural disasters, he said. He said the Rocky Mount city utilities director contends the city has missed out on big economic development projects because it can’t offer natural gas to business and industry prospects. Richardson questioned who would now pay to tap into the pipeline to spur economic development, noting that neither Rocky Mount nor Nash County governments have the financial means to run secondary lines to the city. She said schools in eastern North Carolina need more spending on education, but the $57.8 million would have better served to create jobs. Jackson said Cooper’s deal would have helped sweet potato and tobacco farmers who dry their products for market. Farmers using low-cost natural gas have an advantage over competitors using electric or LP gas equipment. That’s vital at a time commodity prices are low, and production costs cut into a thin bottom line, he said. Senate leader Phil Berger, R-Rockingham, and House Speaker Tim Moore, R-Cleveland, chided Cooper in a press release directed to school districts in the eight counties that would split the nearly $58 million. “In spite of saying he would allow the bill to become law, the governor has now sued the state to block its provisions from taking effect,” the joint statement said. The lawmakers urged the school districts to tell Cooper how important the money is to them, how they would use it, and how educational improvements help economic development and job creation. State Rep. Jimmy Dixon, R-Duplin, is among those who have defended the passage of H.B. 90, and steering the money to education. Moore spokesman Joseph Kyzer issued a news release Thursday morning citing 20 times Cooper said investing in education is the best way to improve the state economy and create jobs. Jackson hesitated to say he would support a future Republican governor using Cooper’s pipeline fund as a precedent to set up a side deal for collecting state money, and assuming authority for how it would be spent, cutting the General Assembly out of the process. He said it was a hypothetical question, and particular details would matter. He said the pipeline fund was initiated by local economic developers and agricultural interests, but he didn’t know how it shifted from grass-roots activists to the governor’s control. Jackson was asked about the governor’s office withholding public records detailing that transition, despite requests from various media organizations, and whether the documents should be disclosed. He said some documents have been made public. “I think this is Sunshine Week, so there’s been an added focus this week on governmental transparency. I for one am in favor of that,” he said, referring to the national observance of the public’s right to know how its government conducts business. Jackson said Republicans insist Cooper should cooperate and compromise with them. Yet they started off in a bad relationship when Republican-sponsored bills stripped the governor of some powers after he was elected, but before he took office. Now, the state’s GOP chairman and executive director are accusing Cooper of a crime and asking for a federal investigation into his pipeline deal. “I don’t think that relationship is going to improve over current circumstances,” he said.